This is the Spaceship Club ship from September 2018, now available to everyone! It's based on the sketch card from January 8, 2018. 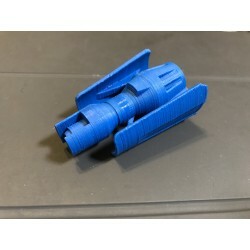 3D Printed in tough ABS plastic, these colorful "Hot Wheels" sized (60mm long) toy spaceships are fun for young and uh, more experienced star-hoppers! 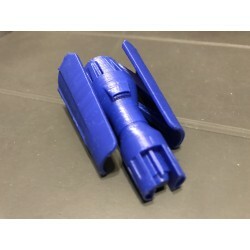 You can also choose a plain gray version if you'd like to try your hand at sanding, painting and finishing your ship. Not recommended for children under 6 years old. Colors may vary from photos and may be substituted without notice.